In recognition of the arrival of SPRING, the Edgefield Community Development Association is sponsoring a Downtown Spring Celebration Stroll Thursday May 9th from 2:00 until 8:00 PM. Local merchants will open their doors to welcome spring shoppers to peruse merchandise while enjoying a glass of wine or other fun cocktail and tasting delicious treats, offering up a fun filled evening of hospitality and specials in their shops for you to enjoy*. Have dinner at one of our great eateries along the way! Make sure to get your shopping passport at The House Next Door, The Edgefield Trading Company, Chef Bob’s or Jane Bess Pottery and have it punched by at least 7 locations that you visit for a chance to win an over-the top-gift basket. 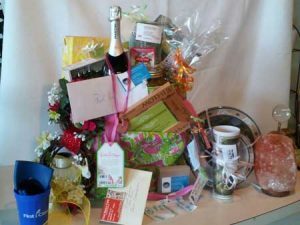 All of the contents have been donated by merchants, restaurants and artists; lots of gifts for you or your special someone on Mother’s Day. One Response to "Downtown Edgefield’s Come Celebrate Spring Stroll – Today"